Bug bites are a very serious problem and can be extra troublesome for people who are prone to allergies and infections. Bites can result in infection, rashes from itches and sometimes also transmit disease. They can also be a major reason behind your mood swings and disturb your daily routine. Flea bites and bed bug bites are the most common bite problems that you may face. It is very important to know the difference between them. In this article, we will highlight the differences between them, problems they can cause you, their symptoms, and how you can treat them effectively. We care for you, and that is why we have consulted dermatologists before writing this article and spent considerable time doing research on this topic. We will identify the differences in their physical appearance, their habitat, and how their bite looks like. They are wingless parasitic insects and are commonly sized around 2-3 millimeters in length. They have long legs for jumping and can jump around 10 inches vertically and 15 inches horizontally. Their body is flattened and is usually dark colored. They mainly feed on animal hosts, but can also bite humans as well. Fleas can be dangerous as they have the ability to transfer diseases while feeding. Fleas exclusively live and develop on hairy mammalian animals like cats, dogs and other furry animals like rats and chinchillas etc. their habitat is hair because their body is shaped in such a way that a hairy surface facilitates their movement. It is pertinent to highlight that fleas live only on hairy surfaces they can lay their eggs almost everywhere. You can also find them on furniture and upholstery in the room where your pets spend most of the time. Flea bites appear like little red dots that are hard and swollen. They can develop into small clusters and can look like mosquito bites. Flea bites itch a lot and are mostly found on ankles and lower limbs as these areas are easy for the fleas to reach. 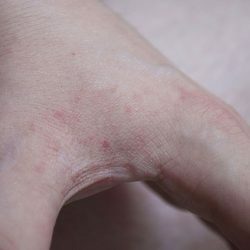 The clusters developed by flea bites are random and shapeless. As compared to fleas, bed bugs are oval shaped and flat. They have a reddish-brown color and are 5-6 mm long and 2-3 mm wide. They do not have any ability to spread diseases. They can be compared in their appearance. You are most likely to find bed bug bites on upper parts of your body like neck, chest, face, back, and arms. Bed bug bites appear like small red spots with a darker red spot in the middle. Bed bugs bite you in close proximity and may form a straight line or a circle. Symptoms can vary from one individual to another. Depending upon the skin-sensitivity and immunity against rashes, it is possible that you will just have minor rashes and they will go away in a while, or you might have to deal with them through proper medications. The symptoms may also be different depending upon the strength of bugs in your home. Symptoms of flea bites are listed below and appear within half an hour after you are bitten from them. Secondary reactions can develop if you scratch the bitten area. Fleas have the ability to transfer diseases, so if you are bitten by a flea, make sure that you go through a proper treatment course. Bed bug bites have the following symptoms. Based on your skin sensitivity and your immunity against such insect bites, you can develop the following reactions. Timely treatment is very important for both of these bites. Here, we will not only discuss treatment, but we will also explain some prevention techniques for both of these bugs. Treatment of flea bites is simple. All you need to do is wash the infected area with soap and water. Applying an ice pack will help in calming down itch. Antiseptic creams are very helpful in fighting rashes from flea bites. If there is some discharge from the bitten area, consult your doctor urgently. The first act of treatment is washing the area with soap and water. You can also use ice to calm down the itching. Applying a paste of water and baking soda for an hour or two and washing it thoroughly helps in clearing the rashes. It stops the bites from becoming blisters or hives. A warm water bath infused with peppermint oil helps a lot in reducing the itching and chances of infection. Try pesticides or seek help from professional bug prevention services. If you are facing the bug bite problem on a continuous basis, then it is very likely that you have an infestation problem in your home. With the help of following signs, you can identify that either you have a bed bug infestation or a flea infestation. Your pets will start to scratch and bite themselves more often, meaning they are infested. Pets start to tear out their own hair if they are suffering from flea infestation. If you do not have any pets in your home, it is possible that you may still have some species of fleas around your house from your neighbor’s pets or other passing by animals. Put on your white socks and walk around your house, if fleas are present there, they may jump on your socks and you can see them easily. Your sheets will have reddish brown stains, indicating activities of bed bugs. These stains can indicate a population of bed bugs in your house. Bed bugs are usually found in the night. If you notice them in day-time on your bed or nearby walls, you have a serious problem of bed bugs on your hands. We are sure that after reading our article, you are now fully aware of all the difference between fleas and bed bug. We hope that you can now get rid of these bugs and deal with their bites in a better way.